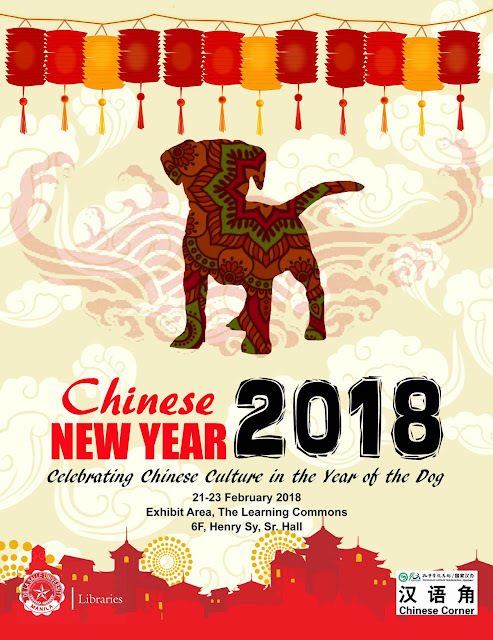 ​The Libraries, in partnership with ENGLICOM, cordially invites the academic community to its celebration of the Chinese New Year with the theme “Chinese New Year 2018: Celebrating Chinese Culture in the Year of the Dog” to be held on 21-23 February 2018 at the Exhibit Area, The Learning Commons, 6/F, Henry Sy Sr. Hall. Lunch ‘N Learn at the Libraries: ​2018 Year of the Earth Dog: What is your Qi? Updates on the CNY Celebration 2018​ and other upcoming activities will be announced through the Libraries' Facebook page. For more information, kindly contact the Libraries at local 620 or send an email to library@dlsu.edu.ph.